Have you ever been looking for a job with full dental benefits and the tastiest turkeys money can buy? If so, then you're in luck, my dear reader! This November, 2015, Scott Lobdell, Denis Medri, and Blond, need some guinea-pig-volunteers for their new business venture... “Hero for a day”! Disclaimer: They don't take responsibility over any possible harm this activity could cause. You would have thought that Sara Phina and her “Hero Manifesto” would be very happy since the Joker's Daughter (JD from now on) murdered Roy at the tail end of last issue. But no. Not really. As it turns out, Sara and her group were hired to take down Rent-A-Bat on their own. And now, thanks to JD's interference, they are unable to achieve their goal. 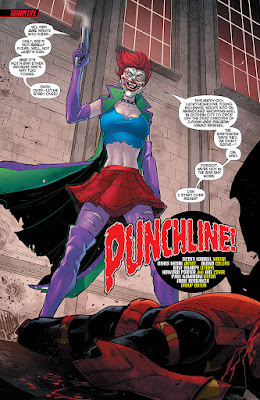 But don't worry, before they can vent their frustrations out on this crazy clown, JD makes an unexpected offer: she will take down Red Hood next if the Hero Manifesto enlists her into their group. Of course, Sara Phina is only interested in fulfilling their contract, but she still agrees to JD's proposition, prompting JD to take something from Roy’s body and leaves in pursuit of Jason. And where is Jason? He's waiting at the airport, feeling anxious about Roy missing their flight. But, surprise-surprise, his concern is short lived, as JD suddenly turns up and try's to saw off the plane's wing with a chainsaw. On the whole Jason is more annoyed than worried at this turn of events, and quickly goes to deal with this female Gremlin impersonator. While fending her off, though, Jason notices that she is not really into it, not that different from how Jason himself behaved during his previous attempts at taking Batman's life. This hesitation allows JD to escape, but oddly enough, she goads Jason into following her. Now back with the Hero Manifesto and we find out that Roy is alive and well (you didn't really think he was gone, did you?) and that JD just shot him with a paintball filled with body parts to make it look like she had killed him. Taking advantage of this surprise, Roy quickly dispatches most of the Hero Manifesto by himself, noting how for some reason he feels bad about killing them. Not so long thereafter Jason then turns up to save JD from Sara Phina's wrath, and together, with Roy, they finish the remaining members of the Hero Manifesto, once and for all. Finally, once the baddies are dealt with, JD reveals the reason behind her behavior: Everything she did was meant to get the boys' attention because she wishes to join them. The most surprising part? Jason accepts her under the condition that she stops killing people for good. Jason even makes a vow to stop killing from now on so he can set a good example! Quite the surprise, isn’t it? Take your time to process this sequence of events, I’ll wait. After the slightly underwhelming installment last month, this month is a return to form on Lobdell's part. We all knew Roy wasn't gone, although Lobdell still managed to keep us guessing for quite a few pages, all done in such a way that I couldn't help but smile at the reveal behind Roy's survival -- the idea is truly worthy of someone claiming to be the Joker’s heir. Lobdell also has to be praised on his use of JD, one of the worst handled characters (if not the worst) introduced during the N52. DC clearly had high hopes for her but so far no one had been able to make her appealing to the readers. In fact, this whole issue feels a little Meta, with Roy and Jason clubbing JD's awful reputation and the insanity of them working with her. Jason also makes a point of noting how a lot of that criticism aimed at her was valid for them at some point or another. It's like Lobdell's using the story to make a point of how there aren't bad characters, just bad writing. 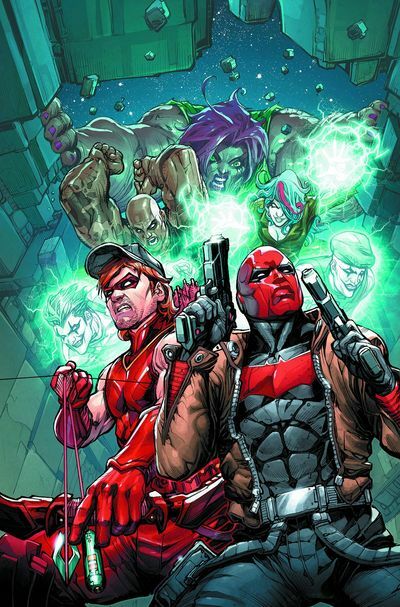 He took Jason under his wing and gave him a place within the DCU, so who's to say he can't do the same for JD? Now, from an in-story angle, the idea of Jason trying to redeem JD makes a ton of sense when you give it some thought. Jason knows what it is to become a pariah due to the Joker’s influence / actions, how important it is to be given a second chance, and how having someone that believes in you can help you turn your life around. So it's only natural he would be willing to offer the same to someone else. I've seen comments on the internet lately about how stupid it is to have someone with Joker's face around Jason, claiming it would trigger painful memories and whatnot. But that is the beauty of the situation: It perfectly shows how much Jason has grown as a character since the start of the N52. He has fully moved on from his past and has taken back the control of his life, not letting the Joker hold any kind of power over him. And you know, redeeming Joker's biggest groupie is the perfect way to stick it up at the man himself. However, the script still has some weaknesses. Mainly, the Hero Manifesto and its creator, Sara Phina. Since issue two the group has been developing with small teasers here and there, yet their debut is obviously flicked out, spat out, rushed. There isn't a real explanation of how Sara picked up each member nor how she pretended to defeat Jason and Roy with enemies they once beat already -- Roy even shoots most of them in this issue! That said, though, considering the book is being pulled into the Robin War crossover next month, and the solicited text for this issue had little to do with its content, I'm willing to give Lobdell a pass since obviously there were some circumstances beyond his control at play here. What's more this episode marks Medri’s final collaboration, where he delivers one of his best (if not the best) works so far. The opening pages with Roy's inert body laying in the background are really unnerving, whereas the action and set pieces are detailed and very fluid, elevating Lobdell's script to completely new heights. 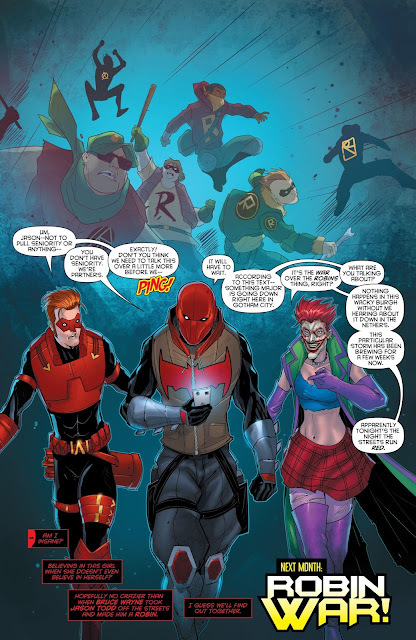 Another element worth pointing out is that this issue also seems to mark the end for Jason and Roy's new costumes (both solicits and appearances on other books have them in their 'Rocafort outfits'). I know the redesigns weren't to everyone's tastes, but they were functional and pretty distinctive, perfectly fitting the characters. So I can't help but be disappointed at this change. As good as Medri's art is, it wouldn't be the same without the proper coloring and Blond doesn't disappoint with his work. His crisp and bright colors are the perfect match for Medri's pencils. And luckily for us, he will stick around with the new artist. In the scene where Jason is trying to offer a broken girl the same chances he once had at redemption, I couldn't help but think of Linkin Park's “Castle of Glass”. Our characters may be broken and seemingly ill-fitting for society, but even they have an important role to fulfill within the bigger picture of life. Jason's willingness to accept JD into the fold, and his intention of offering her the chance of redeeming herself (despite Roy's arguments), brought to my mind the bible passage of “Jesus and the woman caught in adultery”. “He that is without sin among you let him cast the first stone”. Despite its shortcomings this issue continues the trend we've come to expect from it and its creative team -- quality, quality, quality. And while, yes, it does mark the end of Medri’s era, he goes out in his prime, setting a very high standard for his successor. For his part, Lobdell introduces a new status quo that offers an incredible potential for stories and character development that honestly, I'm not sure where he can go with it, but I'm willing to follow him on this crazy ride. The sky is the limit! Crazy sky, ha!